Arsenal vice-chairman David Dein has defended Arsene Wenger's policy of signing foreign imports after criticism from West Ham boss Alan Pardew. Pardew was disappointed Arsenal did not field a British player against Real Madrid in the Champions League. 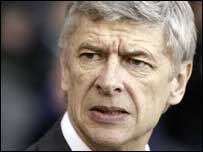 Wenger hit back at Pardew's remarks as he said: "Football is about quality... not anything else." And Dein added: "The fans want a winning team, and if we can get English players, that's a bonus." Dein insisted there is an English influence on Arsenal's squad, and said the club's youth policy is scouring the home countries for talent. He said: "We have Theo Walcott, but we are waiting for Sol Campbell and Ashley Cole to come back from injury, so they are there and if Arsene thinks they are fit enough then they have a chance to get into the team. "At the moment there are English players in the squad, and if they are good enough then they come through. "It is certainly not for the fact we don't put a lot of money into our youth development, because we do. "Liam Brady is searching the country to get the best English talent, but as and when we have to, we go abroad to bring the talent in." And Wenger said: "The English team is responsible for representing the English nation. I don't understand these remarks. "When you're a young boy of 20-years-old, you accept that somebody says to you that you're not good enough. "You don't expect managers to say sorry you don't have the right passport. "Racism is nothing to do with colour, it's only linked with where you come from or how you look. "We want to kick racism out of the game and that's the responsibility of managers and the union. "I feel responsible for the traditions of the club. We represent a football club which is about values and not about passports." Pardew said: "I saw a headline saying Arsenal are flying the flag for Britain. "It's important that top clubs don't lose sight of the fact that it's the English Premier League and English players should be involved. "Foreign players have been fantastic. We have learned from them and from foreign coaches. But, to some extent, we could lose the soul of British football - the English player.